Mark baby's milestones with this sweet, picture-ready swaddle inspired by sidewalk fun. In a hop and a skip, they'll be all grown up. 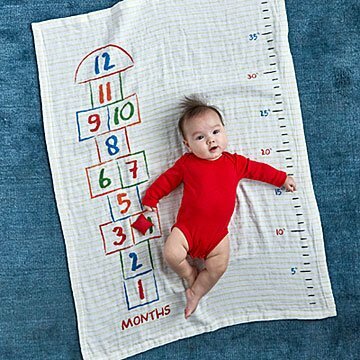 Mark baby's milestones with this sweet blanket/swaddle inspired by Saturdays playing on the sidewalk. The hopscotch design captures their height, and a lavender-filled bean bag marks their age. It's a nostalgic way to record a time when life really is all fun and games. Made from muslin in China. Machine wash and dry. Gentle cycle. Big Hit with New Mom! Great as a wall hanging when not in use. Great for pictures of our little preemies progress! !